Lyn and Mel hosted me several times out at Mabel Lake! What a magical place! I took a boat ride from the river mouth to get to their cottage/home. Old Laurie-dog was still with me those years. Moments that are particularly beautiful out at Mabel Lake are the early mornings, when the water is so calm. We look across the lake to such an awesome horizon. As the sun comes up over the mountain, the sparkle begins to dance on the water. I’ve been skinny dipping out at the lake, with a few really close friends and laughed and giggled until my stomach hurt. I have enjoyed many cocktail hours…a glass of wine while preparing dinner…jalapeno chips with a beer, on the deck. 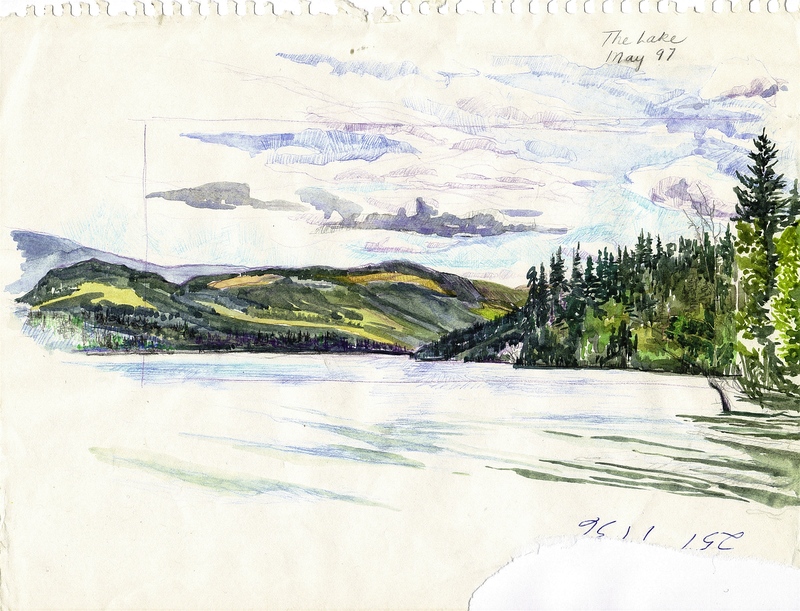 Mel took me for a boat ride directly across the lake and I remained there all afternoon, painting a panel of Torrent Creek. Mystical! Lush green! Beautiful! I miss Mabel Lake…but, most importantly, I miss my dear friends who live there year-round.